Find interviews and information on the final day of the tournament. 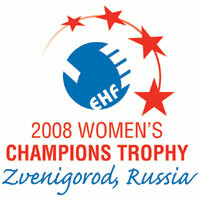 Day 2 in Chekhov will see the 3/4 Final and the Final of the 2008 Women`s EHF Champions Trophy. The first game will be between Larvik HK and Dinamo Volgograd at 16:00 local time (12:00 GMT). The referees of the bronze game will be the German couple Geipel and Helbig. The Final of the tournament will be played by last season`s CL finalists, Hypo Niederosterreich and Zvenigorod Zvezda. The referees will be the Hungarian Kékes brothers. The Final at 18:30 local time (14:30 GMT, 16:30 CET) will be broadcast LIVE on Eurosport 2. Eurohandball.com has been reporting on the games directly from Chekhov. You can visit www.ehfcl.com for more stories or click below for the latest interviews.